Such an odd spring it's been, so cold and rainy and occasionally frosty that I lost my whole first planting of precious seed-grown tomatoes and peppers ten days after our usual safe date. Back to the drawing board. Peppers and tomatoes are going to be late this year. Really late. Like October. I had to leave everything in the greenhouse, closing and heating it every night, until May 25. Imagine! Usually by May 1, it's so darn hot in there I'll lose it all if I don't move it outside. Not this year. 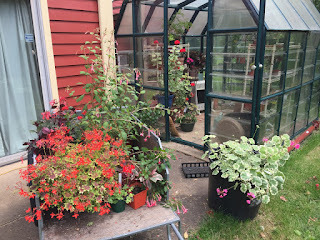 My poor geraniums have gotten so enormous and overgrown that I had to lop enormous hunks off just to be able to handle them; they've grown wildly all winter and most of spring, leaning up against the greenhouse walls, and when I pulled them out their overgrown limbs just flopped down like pretty octopi. I steeled myself and chopped them to a more manageable size. In a gigantic day-long repot-athon, I knocked plants out of small pots and kicked them up to larger ones; made group planters for shade and sun. And when I was sort of done, I stood back and said, "Good Lord. I have way too many plants." I don't know what I was thinking. If I liked something this winter, I propagated it. And I did give a lot of plants away. But I have SO many left. I've got 8" tall Achimenes "Pink Nighty" coming out of my dang ears. But they're such fun to grow! As I hope many readers are now discovering. 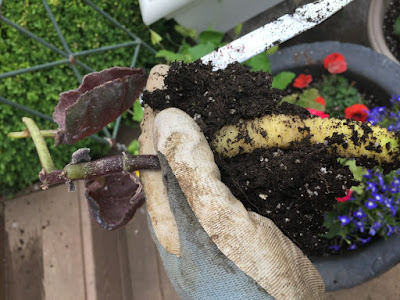 While I was repotting some fuchsias, I pulled a plant out and found a cylindrical tunnel running through the soil ball along the side of the pot. And in that tunnel was a series of neat cigars of what looked like rose leaves, rolled up into segments, and arranged end to end. Here are three of the segments. Each one was capped with a little round section of leaf. They were quite amazing, and still so moist and fresh, as if they'd been made just today. End view of a capsule. By this time I'd called my go-to bug man Corey, who's visiting here this week. We dove in like a couple of Science Chimps into a termite mound, pulling the capsules apart, dismantling one, figuring this conundrum out. Of course I had to open one up. 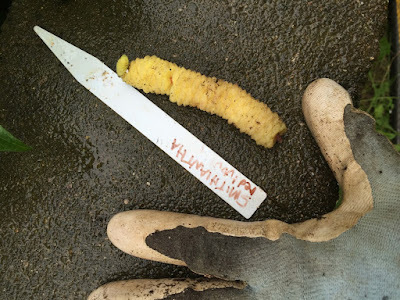 It was full of an alarmingly bright orange goo, and sort of swimming atop the goo was a tiny white flattish larva, no larger than this G. I was so intrigued that I had to taste the goo. From the color, I figured pollen was involved, and from the goopy texture, I figured there was nectar, too. Sure enough, it was sweet, with a bitter tang that might come from the pollen. So this had to be the provisions for the little larva for quite some time. The durn thing was floating in golden food. It would be like swimming in yogurt, or Brunswick stew, and just taking a sip whenever you felt peckish. Corey speculated that it might be the work of a wasp, because wasps are good at carrying stuff; I had a feeling it was a bee, perhaps like the potter bees that invade my greenhouse and have twice filled every gas jet in my space heater with CLAY rendering them UNUSABLE. No more of those please! Wasp or bee, it was dang cool, this series of little nectar and pollen-stuffed grub cigars hidden way down the side of a fuchsia pot. I hated to disassemble this careful creation, and never meant to. 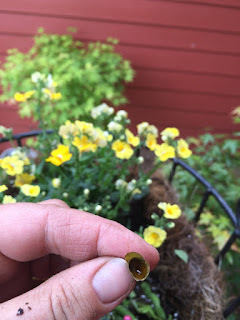 So after opening one to figure out the story, I carefully placed them along the side of one of my hanging baskets, hoping they'd be OK and hatch out. It didn't take long for Corey to come back with the answer: I'd found the work of a female leaf-cutter bee, genus Megachile. These harmless little bees look like a blackish honeybee with a yellow underside. In fact, they gather pollen and deposit it on their extra-furry bellies, which is pretty charming. I couldn't do better than Beatriz Moisset's lovely writeup on the U.S. Forest Service's website. "The mother megachile bee brings pollen to the nest and some nectar in her crop. She kneads the mixture into a bee loaf, adding some of her saliva, which may contain antibacterial and fungicidal substances. It takes many loads to build up a bee loaf large enough to feed one grub from egg to mature size. She diligently visits numerous flowers on her quest to gather the necessary pollen and nectar. When there is enough food, she lays an egg on top. 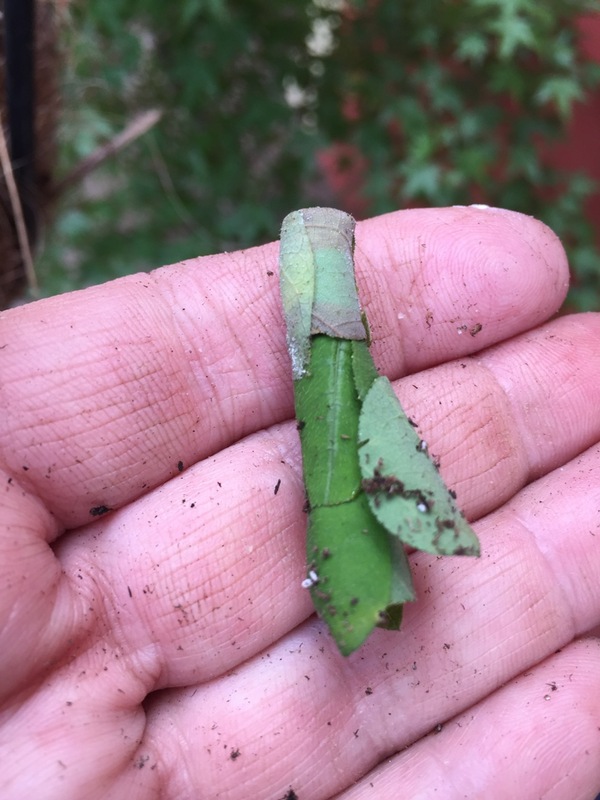 Then she seals that small chamber with chewed up leaves. 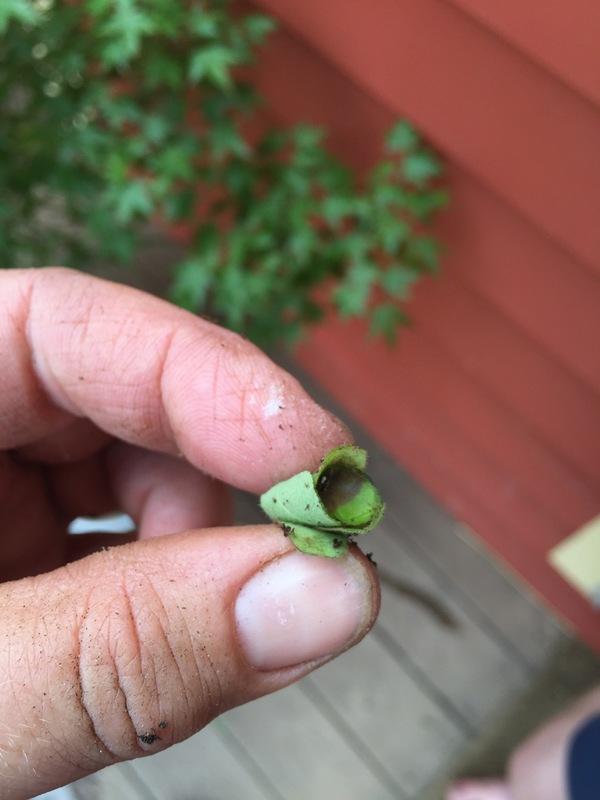 If you notice nearly perfect round holes in the leaves of your rose bushes, do not begrudge them that little material that they need to raise their families. She repeats this process of making bee loaves, laying eggs and building partitions until the entire nest hole is full. Then, she builds a final, thicker wall. Shortly afterwards she dies." I remembered then that this is the creature that Floridacracker has been building little condos for, out of bamboo tubes. How sweet to build an apartment house for a pollinator like that. (He was going for orchard mason bees). I was also extremely stoked that I had tasted beeloaf, being a bit of a meatloaf artist myself. I resolved to make my next meatloaf in the shape of a megachile bee. I totally concur on the possible antibacterial and antifungal properties of megachile bee spit. Those rose leaves looked fresh as daisies. Here's what rose leaves look like after that bee's had at 'em. They don't eat the leaves; they just use them for packaging. Pretty darn cool. I was also pleased I had recognized rose leaves, even in half-moons and circles. 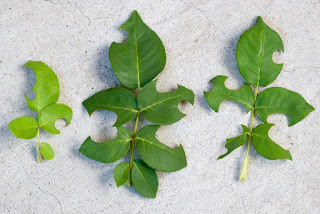 I wondered what it is about rose leaves that work for leafcutter bees. Maybe they retain water well. They looked like multiflora rose leaves to me, glaucous, as opposed to shiny and leathery like my tea rose leaves. Bet you 10-1 rose leaves are preferred b/c of antibacterial/antifungal properties. Take a whiff--those aromatics aren't just for smelling pretty... just did a Google search, and yep. Medicinal properties of rose leaves confirmed to be antimicrobial! There were more surprises to be found in the Great Groanhouse Purge. 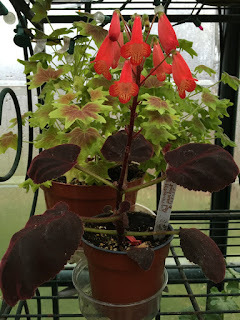 You might remember a gesneriad called Smithiantha. My garden friend Nancy gave me a very small rhizome from hers in August 2015. 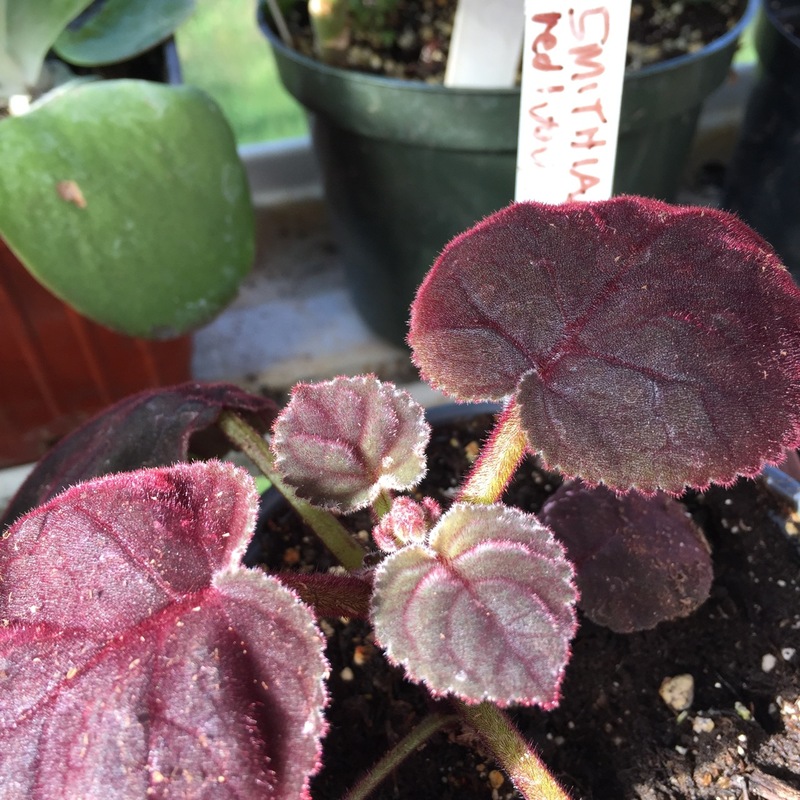 I planted it that winter, and a pretty little velvet-leaved plant came up. It was no taller than 8". It was sweet, and gave a needed dash of color to the proceedings. I wouldn't call it an impressive display, but then it grew from a tiny rhizome, maybe an inch long. 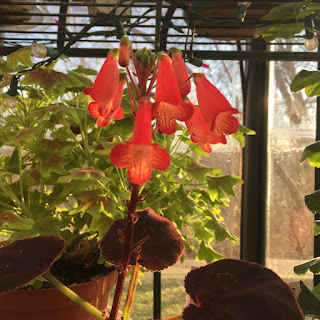 When the blossoms fell off, I cut off the bloom stem, expecting the plant to send up more shoots or multiply or something, but it just sulked no matter what I did. All the side shoots dried up and it just sat there looking mopey. 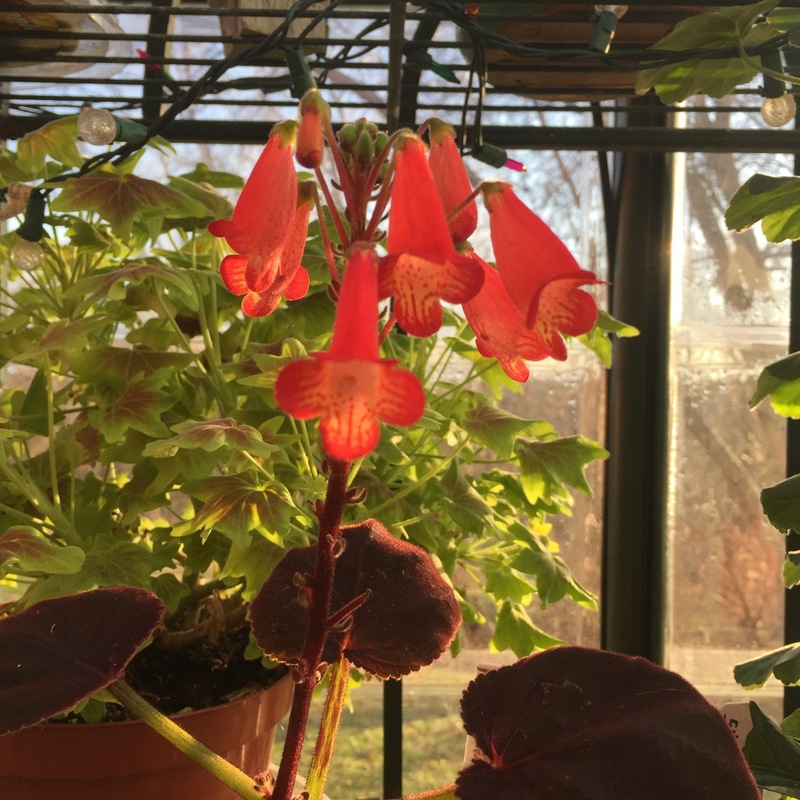 Finally, in the greenhouse purge of May 24, I decided it must have gone dormant, and I pulled it out of its pot to see what it had been up to all that time. OMGGG. It was like finding something quite unexpected in your baby's dipe. Good LORD. What have you grown down there?? The rhizome of rhizomes, Madam. I gift you my giant rhizome, to bring you a little color next January. Why thank you, Mr. Smith!! I put the 4 1/2" monster in a Ziploc bag in my studio. I'll plant it come November, when I need a dash of color to look forward to. But I'm going to use a bigger pot this time! As you may have guessed Smithiantha is related to Achimenes, whose rhizomes have gone out far and wide from my studio mailroom. I love a plant with a dormant phase, and a surprise in its dipe. These are just a few of the wonderful things I have to share. My Achimenes "Pink Nighty" are about 6 inches tall and coming along nicely! I am intrigued by how badly they react to wet leaves. How can they live outdoors and get rained on? Mine are inside - in the kitchen in an east window. Being babied! I would definitely eat some bee loaf! Seeing those rose leaves still looking freshly picked, I can only imagine what it would do for me! I keep imagining the bee in a little apron, kneading her bee loaf, then taking it out of a tiny oven with multiple oven mitts. I learn so much from your blog. Just wonderful. My Pink Nighty are 2+ inches tall. Look healthy but will be more careful about keeping leaves drier...Moved them from west-facing, shaded exposure to easterly porch exposure. We have long growing season in California: hoping for the best.